You are here: Home / Test Preparation / Which test is right for you? Take the new ‘SAT/ACT Diagnostic Test’ and find out! Which test is right for you? Take the new ‘SAT/ACT Diagnostic Test’ and find out! 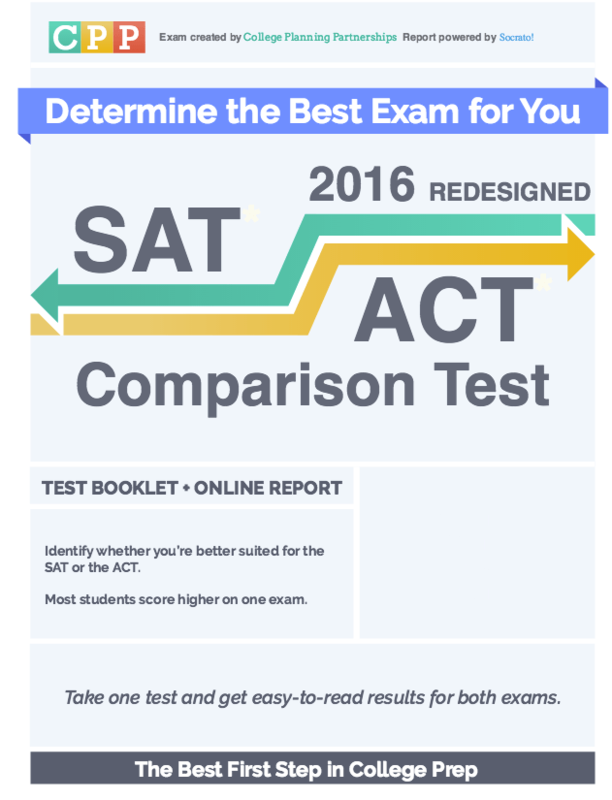 Through a new, strategic partnership with CPP — a company which has spent tens of thousands of hours designing, testing, and refining practice material for the ACT and the new SAT — Biltmore Tutoring is pleased to announce that Asheville-area students now have access to the ‘SAT/ACT Diagnostic Test’ and a comparison test report. The test and diagnostic are only $99 (and that amount will later be credited back to you as a registration fee when your student’s tutoring begins). At Biltmore Tutoring, we believe in a scientific, highly individualized approach to test preparation, and this diagnostic gives useful information on whether a student should study for the ACT or for the SAT. It also gives students some useful background on each test, and is used as a diagnostic tool by our master’s degree and PhD-level tutors when a student begins the test prep process with us. Areas of strength on the diagnostic indicate topics that can be ignored during test preparation, while areas of weakness represent opportunities for students to increase their scores! Focusing in on those areas that a student is not demonstrating mastery is how our tutors have helped students increase their scores by up to 630 points on the SAT and 14 points on the ACT. The SAT/ACT Diagnostic Test itself is a four-hour exam, made up of seven different sections, and is composed of alternating ACT- and SAT-style questions. It measures a student’s ability on reading, math, grammar and science. We deliver the exam on Sunday afternoons at 12:30 PM. You must register in advance for the test. Just contact us and let us know that you want to take it, and we’ll reserve a seat for you. After the student takes the test, one of our educational consultants will be happy to meet briefly with you to go over the results. There is never any pressure, and nobody will ever have to endure a sales pitch. At Biltmore Tutoring, we believe in providing students and parents with as much good information as possible so that they can determine the best course of action to improve their college lists and qualify for scholarship opportunities. The SAT/ACT Diagnostic Test fits in with our educational philosophy in a perfect way. Are you interested in viewing a sample report? Just click the link. To take the diagnostic and to gain valuable information on which test you will perform better on, just contact us, email us at info@biltmoretutoring.com or give us a call at (828) 505-2495.